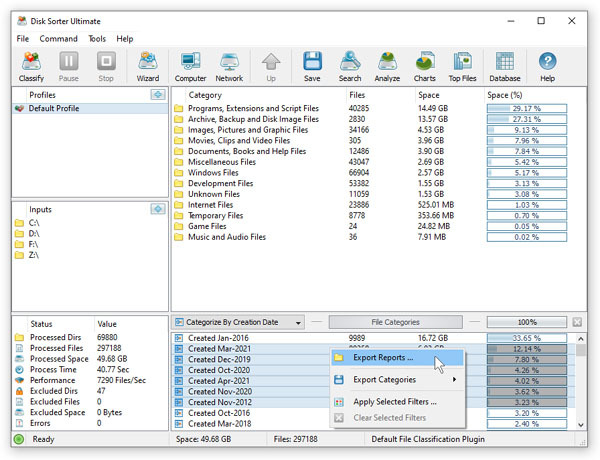 DiskSorter allows one to save batches of file classification reports according to the currently selected categories of files with each report showing the disk space usage and the number of files for a corresponding category of files. For example, let's assume that we need to save file classification reports for the last 10 years with each report showing categories of files and the disk space usage for all files that were created during each year. In order to generate such reports, set the file categorization mode to 'Categorize By Creation Year', select all years for which you need to generate analysis reports in the file categories view, press the right mouse button and select the 'Export Reports' menu item. On the 'Export Reports' dialog, select an appropriate report format and report mode, specify a destination directory to export reports to and press the 'Save' button. For each selected year, DiskSorter will filter file classification results by the file creation year and save an individual file classification report in the specified destination directory with each report file name and report title containing the file creation year. In the same way, the user can generate batches of analysis reports showing categories of files and the disk space usage per user, last modification date, last access date, file attributes, file size, top directory or user-custom categories pre-configured using flexible file matching rules. For example, in order to export individual file classification reports for all users, set the file categorization mode to 'Categorize By User Name', select all the required users, press the right mouse button and select the 'Export Reports' menu item. Now, the destination directory will contain a series of file classification reports with each report showing categories of files and the disk space usage per user. The batch reports dialog provides the ability to export reports to a number of standard report formats including: HTML, PDF, Excel, text, CSV and XML. Depending on the selected report format and report mode, each report will include a summary table showing statistics about the report, a table showing categories of files sorted by the amount of used disk space and lists of files for each category sorted by the file size. In addition, the batch reports dialog allows one to select one of the following report modes: summary report, compact report or full report. 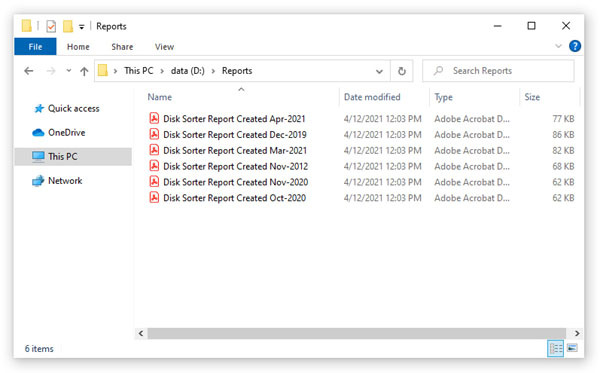 When the summary report mode is selected, each report will include a summary table and lists of file categories sorted by the amount of used disk space. When the compact report mode is selected, each report will include a summary table, lists of file categories and lists of top 100 files per file category. When the full report mode is selected, each report will include a summary table, lists of file categories and full lists of files per category sorted by the file size. Once the export operation will be completed, the specified destination directory will contain a number of file classification reports according to the selected file categorization mode, selected categories of files and the selected report format.